Why listen to this episode? Amy is a well known a psychotherapist and wonderful to talk to! Since 2002, Amy been working as a psychotherapist helping people address issues ranging from depression and anxiety to parenting problems and stress management. She has worked in community mental health centers, schools, and doctor’s offices. Over the years, she noticed that some people were more resilient than others and she began to study what makes people mentally strong. In 2003, Amy’s mom passed away unexpectedly from a brain aneurysm. Then, on the three year anniversary of her death, her 26-year-old husband died of a heart attack. A few years later, her father-in-law lost his battle with cancer. Amy’s personal journey through grief taught her a lot about mental strength. In 2013—at one of the lowest points in her life—Amy wrote a letter to myself called 13 Things Mentally Strong People Don’t Do. She published it online in hopes it might help someone else. Her letter went viral and was read by over 50 million people across the globe. Soon after, she wrote a book, also called 13 Things Mentally Strong People Don’t Do. It became an international bestseller and has been translated into more than 30 languages. 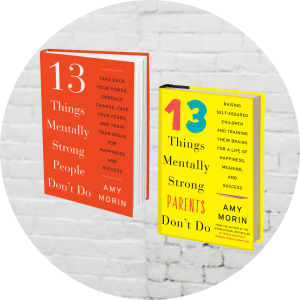 Amy’s latest book, 13 Things Mentally Strong Parents Don’t Do, teaches parents how to raise mentally strong kids. Amy speaks to organizations all over the world about mental strength. Whether it’s a quick keynote speech to a group of salespeople or it’s an all-day workshop for pro athletes, Amy teaches people to train their brains to think differently so they can reach their greatest potential. Her TEDx talk is one of the top 30 of all time with more than 8.5 million views. She also teaches individuals how to build mental muscle in her online Mental Strength course. Amy is also a columnist for Inc., Forbes, and Psychology Today and is am a parenting expert for Verywell. Amy Morin and her Ted talk have over 8.5 million views!